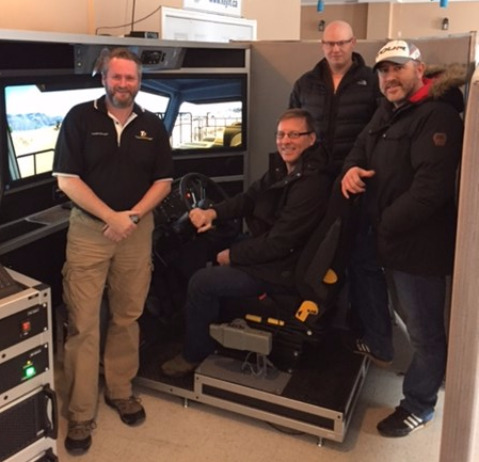 Immersive Technologies has mobilized a managed training solution which includes Advanced Equipment Simulators and embedded staff at Canada Flurospar. Immersive Technologies’ embedded training staff have already aided the recruitment and assessment of equipment operators and will soon shift focus to improving equipment operator performance once the mine is operational. Steve Cole, Project Manager, Canada Fluorspar. The new-hire curriculum developed by Immersive Technologies aligns with the Fluorspar Standard Operating Procedures and will later be tailored to deliver quantified operational improvements with the aid of Fleet Management System data. Immersive Technologies has successfully applied and refined this process at mining operations around the world including those operated by BHP Billiton, Rio Tinto, Vale, Glencore, Barrick, Newmont, Freeport-McMoRan and Anglo American. “In support of their training and workforce development needs, mining operations are increasingly adopting the combination of our technology, our process and our people. This combination allows us to drive sustainable results faster and at multiple levels. Greg Karadjian, Immersive Technologies Regional Vice President – North America. Fluorspar has recently received a second simulator and Immersive Technologies is managing the execution of the simulator training program along with Fluorspar to achieve a sustainable and optimized workforce. In 2017, Canada Fluorspar in Newfoundland Canada, will commence mining high quality fluorspar ore, produce fluorspar concentrate and export their product to domestic and international markets. Fluorspar has recenlty received a second simulator and Immersive Technologies is managing the execution of the simulator training program along with Fluorspar to achieve a sustainable and optimized workforce.